Van Beek, Drunen, the Netherlands, recently supplied a Dino mobile bulk truck loader to Boxtel-based Reijnders BV, a leading Dutch trader in coal and coke products. With regard to the latter fuel, after being sieved to a maximum particle size of 2mm, it is used as a raw material for the steel industry. “The coke is available from us on call. 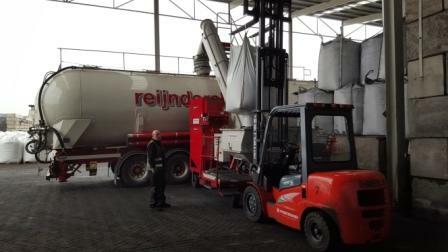 We then load it from the big bags into bulk trucks and take it to the client", explained production planner Ruud van Kollenburg. Before acquisition of the Dino the bulk bags were emptied with a shovel, which was labour intensive, slow and generated dust. The new dustfree work environment is thanks to the dust filter system with which this Dino is equipped. On filling the bulk truck the displaced air exits through the manhole. However this is connected to the Dino. The escaping air first has to pass through a filter and the dust is removed before it enters the work environment. The bulk truck loader also has a loading bellows, expansion rim, cover, a heavy-duty motor (37kW) and fluidising pads in the hopper.